James Byron Dean (8 Februar 1931 – 30 September 1955) wis an American actor. 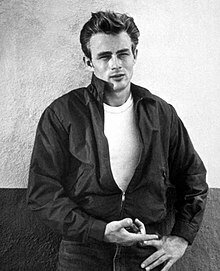 He is remembered as a cultural icon o teenage disillusionment an social estrangement, as expressed in the teetle o his maist celebratit film, Rebel Without a Cause (1955), in that he starned as tribbled teenager Jim Stark. The ither twa roles that defined his starndom war loner Cal Trask in East of Eden (1955) an surly ranch haund Jett Rink in Giant (1956). Efter his daith in a caur crash, Dean becam the first actor tae receive a posthumous Academy Awaird nomination for Best Actor, an remeens the anerly actor tae hae haed twa posthumous actin nominations. In 1999, the American Film Institute ranked him the 18t best male movie starn o Gowden Age Hollywood in AFI's 100 Years...100 Stars leet. This page wis last eeditit on 30 September 2018, at 05:38.